For one week only view Elsa online! 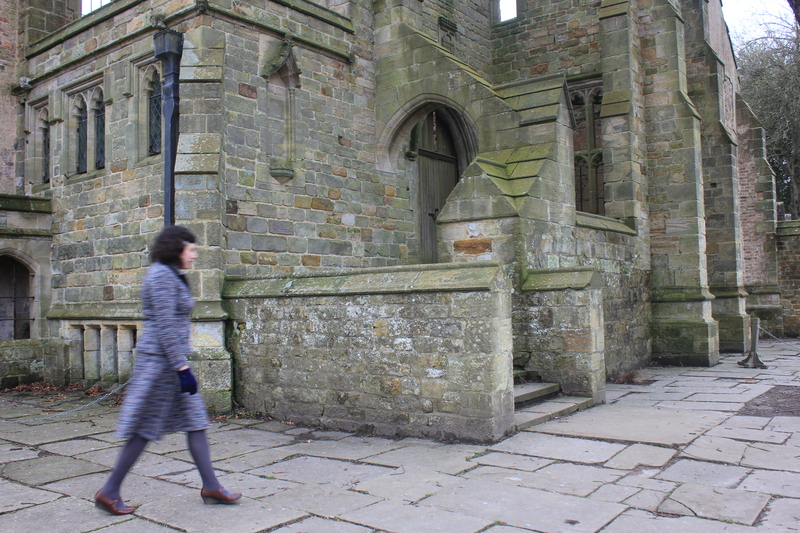 ‘Elsa’ stars is a short silent film, part of the site-specific work ‘They loved to breathe beauty, tradition and romanticism…”, originally made for the National Trust Property, Nymans. The film follows “Elsa”, a fictional character relative of the Messel family, invented and performed by Lucy herself. Elsa explores Nymans hoping to learn something about her family roots and heritage. As Elsa moves through the gardens, ruins and interior rooms she senses the presence and lives of her relations Maud Messel and Anne Countess of Rosse. The film uses the Nymans house and gardens as a film set, exposing the spaces within the property that the pubic don’t get to visit; such as the ruins of the Great Hall, or spaces which are cordoned off; like the Garden Hall where Elsa peers into Mauds’ sewing box. Elsa also takes a moment where the original staircase once stood. Some of the vintage garments worn by Elsa in the film, were used as raw material in the garment woven sculpture installation. The film developed from Browns’ desire to select the vintage garment raw materials through the on-site wearing on location at Nymans. Filmed on location at Nymans, West Sussex. February 2012. With thanks as always to the National Trust (Enterprises) Ltd, Paul Dutnall Junk TV and Unravelled Arts. Elsa’s running time is 5min 42 sec. and can be viewed until the end of the longest day – Sunday 21st June…. Summer Solstice 2015! This entry was posted in Exhibtion, News, Site Specific Works and tagged event, Exhibition, Invitation, National Trust, Nymans by lucybrownmakes. Bookmark the permalink. Always interested in what you are doing since we met in 2003. I found this video piece quite melancholic. I ran it three times as it was packed with detail and absences. I felt the narrative with out reading it. I am curious as to what you picked up off of the floor in the abandoned chapel? What a stunning ruin. As I have just downsized after the death of my husband the film resonated with me. I realise that I have not made work for some time and need to begin again.